I'm not good at planning ahead. Especially when it comes to dinners during the week. You see, I'm in charge of dinner in our household. Most days I don't decide what to make until the morning of (if I'm lucky) or afternoon that day. It can be stressful at times. 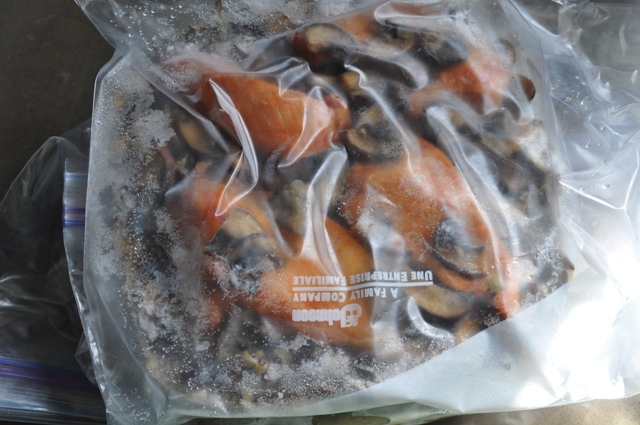 And it doesn't really allow any pre-preparation such as marinating when you take a frozen piece of meat out of the freezer a few hours before you want to cook it. Hubby has suggested a little strategic planning to make things go more smoothly during the week. Can you say procrastination? A few weeks ago I made my first real attempt at true dinner strategy. I was inspired by my friend Shannon who gave me some plan ahead tips and one of her recipe successes. I had my big cook day on a Sunday and made enough food for 7 meals for the two of us. Granted, it wasn't 7 meals to eat in the same week, but it was multiple portions of two dishes, most of which went into the freezer for future weeks. 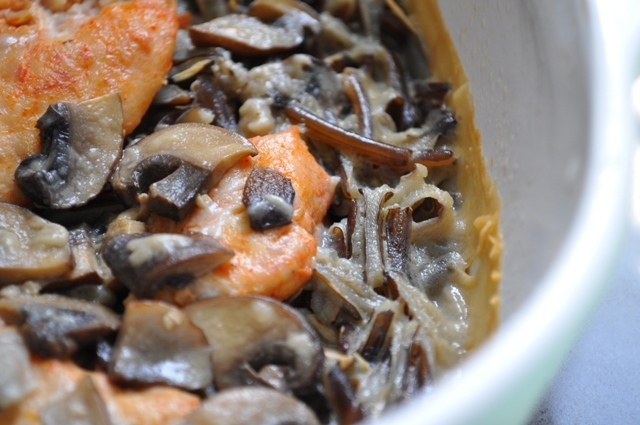 I started off with Shannon's recipe recommendation for Chicken and Wild Rice Casserole. It makes 6 portions...so that's 3 meals for Hubby and me. I kept one portion out for the current week and froze the other 2 portions. The second dish I made was actually a sauce.....this delicious tomato cream sauce. I tripled the recipe and it made 4 pouches. Each pouch is enough to generously sauce 1/2 pound of pasta. I kept one pouch out and the other 3 went into the freezer. I was a little concerned that a sauce containing cream might not freeze well, but it fared pretty well. The one thing I would change next time is to hold the fresh basil until the day the sauce is used. Back to the chicken dish. I'm going to be frank. It didn't turn out perfectly. Well half of it was perfect and super yummy. The creamy, mushroom, wild rice half. It was almost like a wild rice risotto. Just a note about the wild rice....this is pure, straight up wild rice. Not a rice blend with a few grains of wild rice tossed in. The real, healthy (and somewhat expensive), deal. Apparently wild rice takes FOREVER to cook. It cooks for an hour on the stove top. 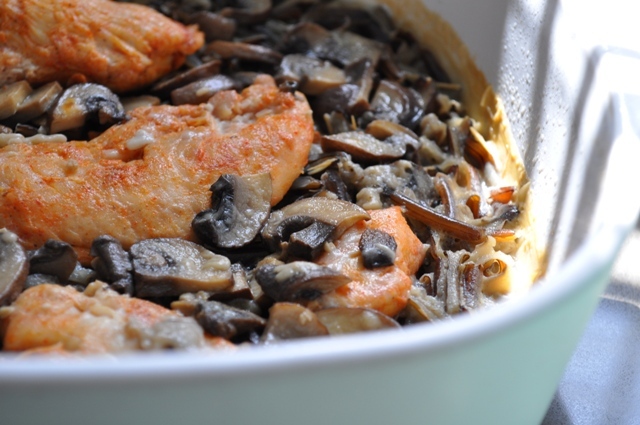 Then it goes into the casserole dish and gets topped with smoked paprika chicken and a delicious creamy mushroom wine sauce. The casserole goes into the over for another 55 minutes. The rice was creamy perfection. And I'm sure you can guess that after 55 minutes in the oven, the chicken was not so perfect. It was dry. Super dry. So next time I have to make some tweaks on the chicken portion. I think I cut the chicken in too small portions and cooked it too long before going into the oven. Or next time maybe I'll just make wild rice mushroom creamy goodness! Who needs protein? Rinse wild rice and drain. Combine rice and 3 cups water in medium pan, bring to a boil. Cover, reduce heat and simmer 1 hour. Spoon into 7x11x2 inch baking dish, set aside. Sprinkle 1/4 teaspoon salt, paprika and pepper over chicken, set aside. coat a large non-stick skillet with cooking spray, add butter, melt over medium heat. Add chicken, cook 4 minutes each side until lightly browned. Arrange chicken on top of rice, top with artichokes, set aside. Add mushrooms to skillet, saute 5 minutes. Combine 1/4 teaspoon salt, flour, next 3 ingredients. Stir well. Add to skillet, cook 3 minutes until thick and bubbly. Spoon over chicken. cover and bake at 375 degrees for 55 minutes. 6 servings. Nice job on making progress with the meal planning! I'm (unofficially) in charge of grocery shopping and dinner at our house, too, and if I don't plan ahead it's bad news. I like to make large dishes on Sunday and/or Monday so we have leftovers for lunches. A creamy mushroom rice sounds delicious! Maybe adding the chicken halfway through would work.